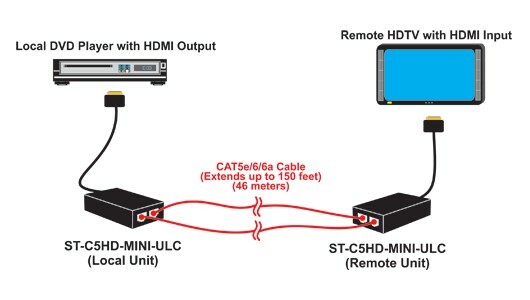 The Mini HDMI Extender transmits digital video and audio signals up to 150 feet using two CAT5e/6/6a cables. 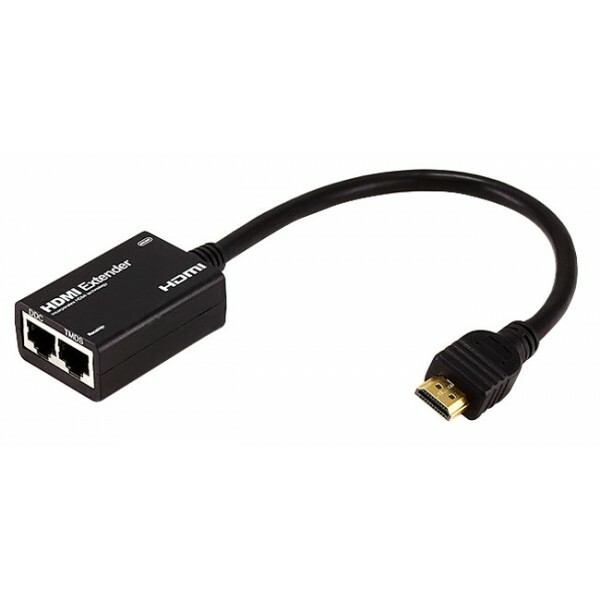 Each extender consists of a local unit that connects to an HDMI source and a remote unit that connects to an HDMI display. Transmits an HDMI signal over two CAT5e/6/6a cables. Extend up to 100 feet with UTP CAT5e/6 cable. Extend up to 150 feet with UTP CAT6a cable. One male HDMI connector for source connection. One female RJ45 port for sending high definition video/audio signals. One female RJ45 port for sending DDC signal. One male HDMI connector for display. One female RJ45 port for receiving high definition video/audio signals. One female RJ45 port for receiving DDC signal. WxDxH: 2.13x1.44x0.84 in (54x37x21 mm) with 8-inch (203-mm) male HDMI cable attached (local and remote unit). Operating temperature: 32 to 158°F (0 to 70°°C). Use CAT5e/6/6a UTP straight through cable for TIA/EIA-568B wiring terminated with standard RJ45 connectors. Extend 1080p resolution up to 100 feet with UTP CAT5e/6 cable. Extend 1080p resolution up to 150 feet with UTP CAT6a cable.